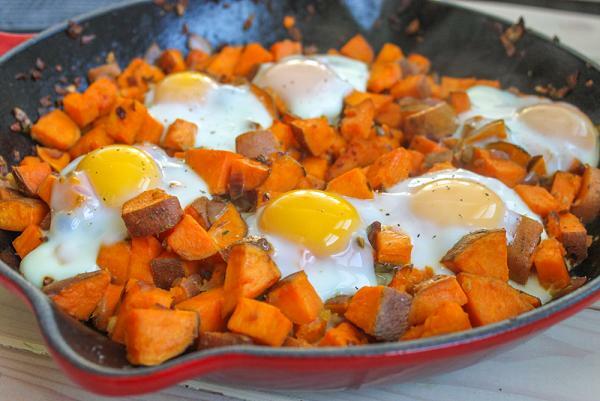 These nightshade free sweet potato turkey hash dish can be served up as a breakfast, lunch or dinner option. To tell the truth, when you start to follow a psoriasis friendly diet plan, you begin to put together meal plans that can be cooked in bulk, packed up in freezer bags/containers and reheated when the time arises. Therefore having meal options that can be used for the different meal times makes your life a lot easier. If you like big portions, then you will love this recipe. I call this the growing boy’s recipe, packed full of so much nutrients and goodness. Place sweet potatoes in a saucepan; add enough water to cover by 1 inch. Bring to a boil and cook 3 to 4 minutes, until potatoes are just barely tender. Drain well and set aside. Heat butter and 1 tablespoon oil in a large skillet over medium high heat. Add onion and cook about 4 to 5 minutes until lightly brown. Add sweet potatoes. Cook, stirring 6 to 7 minutes, until sweet potatoes are crispy. Add remaining oil and turkey; season with salt and pepper and cook for 1 to 2 minutes.